Soufflé. Mere mention of the word intimidates many cooks. Perhaps that’s why preparing one perfectly is one of the penultimate tests on Gordon Ramsay’s Master Chef. Making a soufflé involves preparing a base sauce and combining it with beaten egg whites and your choice of sweet or savory elements, then baking it in the oven and watching as it puffs—sometimes to incredible proportions. But you needn’t shy away from this classic and elegant dish. 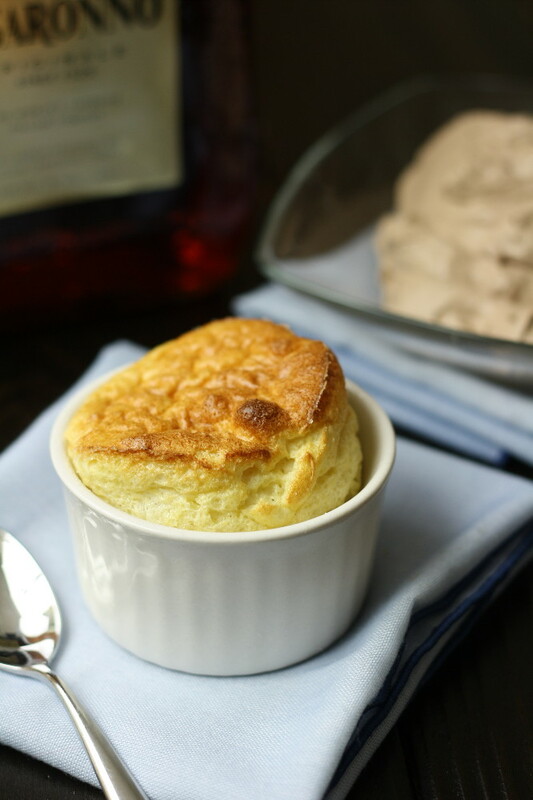 James Beard once wrote, “The only thing that will make a soufflé fall is if it knows you’re afraid of it.” So put away your reservations and boldly embrace this recipe. Plus, with Valentine’s Day just over one week away, this recipe would be a great way to dazzle that special someone. That’s why we’re posting it this week … so you can use this upcoming weekend to try a test run in advance of the big day and build up your soufflé confidence. There are myriad sweet and savory soufflé options. We’ve opted to make Amaretto, fortified with a touch of pure almond extract, the star of the dish. It’s complemented by a simple, homemade whipped cream. Together, they’re a little bit of heaven with every spoonful. 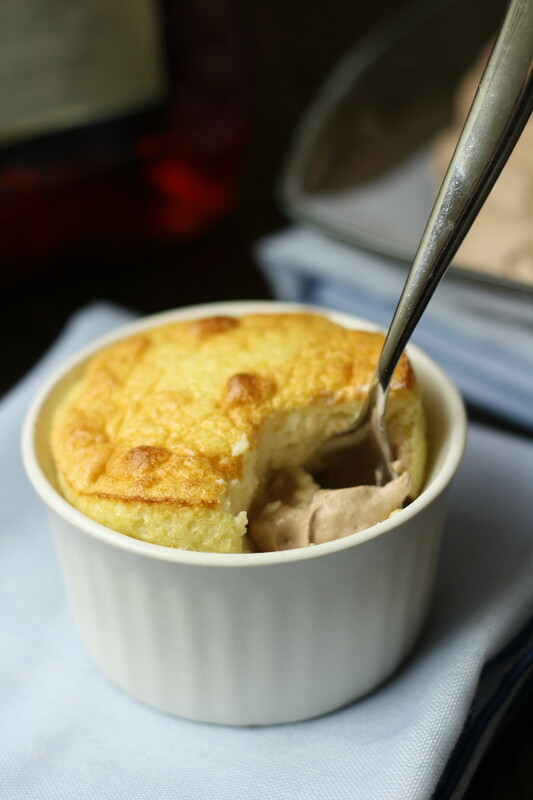 This version calls for individual ramekins, though souffles can also be larger. Either way, they’re a wonder to behold baking in the oven. At first, nothing happens. But then, slowly—but clearly before your very eyes—they begin to climb and rise. The end result melts in your mouth: moist, fluffy, delicate, divine. 2. Whisk in the flour and salt. 3. Stir in the milk over medium heat, stirring constantly until the mixture boils. Cook for one minute. 4. Remove from the heat and whisk in the sugar. 5. In a separate bowl, whisk the egg yolks. Then temper with the milk mixture. 6. Cover and refrigerate to cool for about 15 minutes. 7. Whisk in the Amaretto and almond extract. 8. Preheat the oven to 375 deg F. Grease eight 6-ounce ramekins, sprinkle with sugar, and dump out any excess. 9. In a large bowl, beat the egg whites with a mixer until they form stiff peaks. Then carefully fold into the main mixture. 10. Divide the mixture evenly, spooning it into the prepared ramekins and set them on a large baking sheet, evenly spaced apart. 11. Bake for about 18 minutes, until a knife inserted down the side of a ramekin comes out clean. 12. Meanwhile, prepare the chocolate whipped cream: whisk the cocoa and sugar together, then add the heavy cream and beat with a mixer until soft peaks form. All soufflés fall as they cool once removed from the oven. For the best visual effect, serve them almost immediately. But there’s nothing wrong with a fallen soufflé. They’ll still taste great, and they can even be refrigerated and served later. UPDATE 2/13/13 – This post is part of the Gluten-Free Ratio Rally. Check out host No One Likes Crumbley Cookies for links to a few other souffle recipes! This looks amazing. 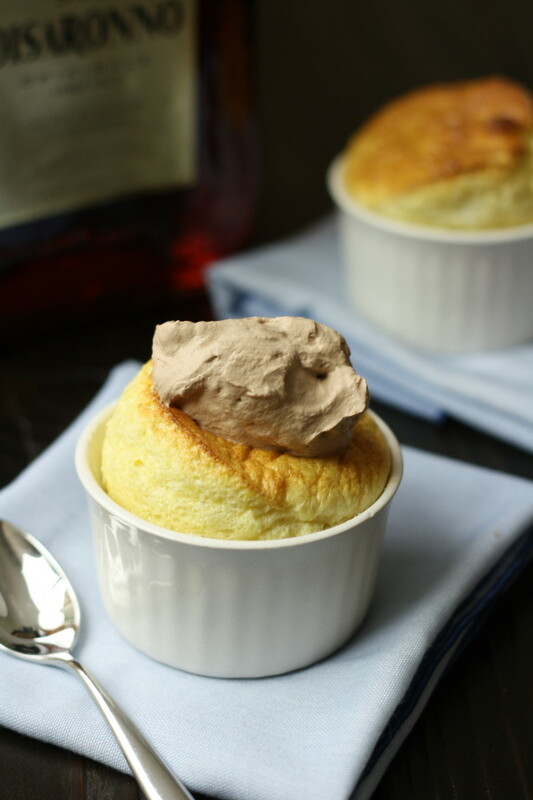 I love amaretto anything, and making a souffle out of it and adding chocolate whipped cream??? My goodness. Thank you for creating this!